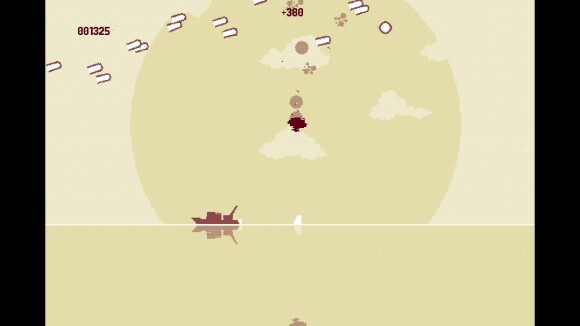 Luftrausers is a very simple game. 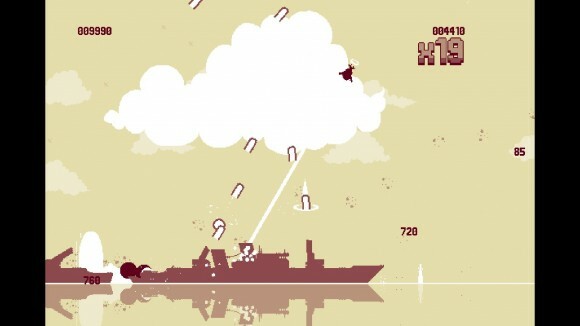 It’s a bullet hell shooter with a rudimentary sense of physics; at the start of each game your Rauser is launched into the sepia-toned sky above a sepia-toned ocean to battle silhouetted hordes of enemy boats and aircraft, and your only goal is to survive for as long as possible while scoring as many points as possible. The former is tricky (a typical game of Luftrausers lasts three minutes or less) and the latter is downright impossible, for reasons that we shall explore later, but the interesting thing about Luftrausers is how it leverages two key elements to become far more than the sum of its very simple parts. Element the first: the physics. The physics system is very, very simple, simulating gravity, acceleration and momentum and not much else, but it’s enough to give the game its own unique spin. 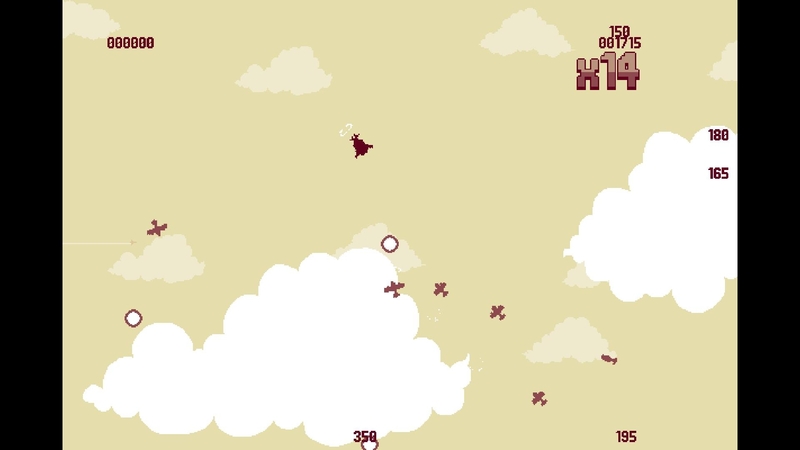 You can move in any direction in Luftrausers, with the play field bordered by the sea at the bottom and clouds at the top and wrapping around on itself as you move left or right. You can enter the sea and the clouds briefly while enemies cannot, but unless you have special parts fitted to your Rauser you’ll take constant damage while you’re in them and will quickly be returned to the play field regardless, making them useful for quick escapes while ensuring they don’t confer permanent invulnerability. Movement is accomplished by thrusting forward, and along with left/right turning this is the only movement control existing in the game. However, thanks to the way this simple movement interacts with the simple physics Luftrausers allows for some very complex maneuvering. When the thrust is engaged your turn rate is drastically reduced, which makes shooting enemies much harder (not to mention the fact that the baddies will likely all be behind you). Cutting the engines will see you immediately start falling towards the sea, but you’ll fall along a predictable trajectory that lets you do a 180 degree turn and line up shots on chasing enemies. You can also thrust straight up, kill the throttle, and then shoot when you’ve coasted to the apex of your climb and are to all intents and purposes stationary. Do this while travelling on a sideways trajectory with a slight upward component and you can effectively strafe an enemy sitting above or below you. Air combat in Luftrausers is consequently all about dodging the extravagant quantities of bullets enemies fire at you long enough to find a two or three second window where you can throttle down and return fire, and this physics system, although basic, lends it a real sense of balletic grace. The human brain instinctively knows how to, for example, calculate the parabola a thrown object traces out as it flies through the air so that we can catch it, and Luftrausers relies on that same instinct to play it well. Consequently Luftrausers is quite easy to grasp, and its accessible nature is aided by it being somewhat more forgiving than most bullet hell shooters in terms of how often you can get hit. You’re still quite fragile, with three or four successive hits being enough to explode your Rauser and end your game, but whenever you’re not firing your weapon you’ll regenerate health. Crucially the Rausers have enough health to survive collisions with most enemy types and they’ll even destroy the weaker ones outright, which means accidentally botching a turn and flying into something won’t ruin your day and might actually be desirable in some cases (especially if you have the Melee body part equipped). You’re given just enough latitude that you can recover from making a mistake and it’s only two or three in quick succession that’ll kill you. 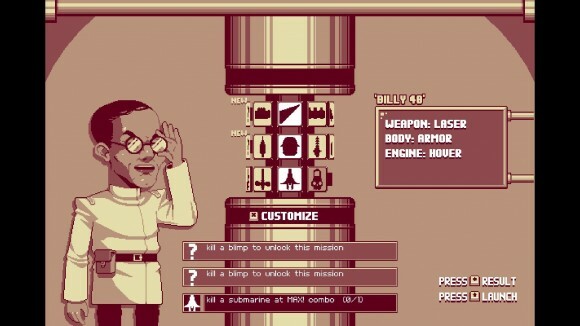 If Luftrausers is so accessible, though, then why do most runs end so quickly? It’s almost entirely down to the way the game spawns its enemies, which is random and not at all satisfying. To score points you kill enemies to build up a combo meter, and each enemy killed within a certain time from the previous kill adds to and sustains that meter, multiplying your score. To start with Luftrausers spawns lots of small, weak fighters that let you build up this meter quickly, along with small boats that yield quite a few points when hit with a maxed out combo meter. After about a minute the fun stops, however, and it starts spawning tougher enemies: battleships that will kill you stone dead if you fly directly into one of their salvos, and large Ace aircraft that are just as maneuverable as you and which spit out enough bullets to ruin your day if they get in behind you. Both of these enemy types are very tough and practically impossible to kill before the combo timer runs out – at least, not while avoiding being hit by their return fire – and once you’ve lost that combo it’s very difficult to build up again because the game can only have a certain number of enemies spawned at once, and if they’re all boats, battleships and aces there’s no weak fighters to pad out your combo total. Luftrausers doesn’t have any sense of balance, happily spawning four aces and four battleships at once without any consideration of just how the player is supposed to kill all of this stuff without being shot down; sometimes it’ll do this, and sometimes it’ll continue to spawn boats and fighters, and since there’s nothing you can do to affect this it feels like the game has been yanked out of your control and that high-scoring runs have more to do with the RNG passing you a bunch of easily combo-able enemies rather than any skill on your part. Past about a minute, then, Luftrausers becomes a question of pure survival, and even then it essentially has a hard time limit built in with the arrival of a giant blimp that can shoot you from anywhere and which is seemingly unkillable – I certainly haven’t managed it yet in four hours of playing1. This time limit keeps Luftrausers restricted to micro-sessions of two or three minutes each, which dramatically eats into its long-term appeal; I feel like I very quickly hit a ceiling that I just can’t break through, and that it would have been a much better game if it had spaced things out over the course of 10-15 minutes rather than cramming it all into three. So the core experience of Luftrausers is an excellent little arcade shooter, and the different Rauser variants go some way towards giving it some longevity. It has incredibly tight design within those core three minutes – the way it represents your health in particular is both intuitive and unobtrusive, while the monochrome pixel art Rausers have nevertheless been honed to the point where you can practically feel the Gs as you throw them into a tight turn – but Vlambeer don’t seem to have been interested in developing the concept further than that brief, repetitive micro-experience. They’ve tossed in some leaderboards as a concession to score-chasing as well as some missions to complete with each Rauser part (showing such startling imagination as “Kill 80 enemies”) that don’t appear to do anything aside from flash up a little “Mission complete!” popup when you complete them, but this is nowhere near enough. For all of its style and élan I’ve played enough indie games with much higher skill ceilings and lifespans to make Luftrausers seem intentionally crippled. It’s a good game unnecessarily limited. It could have been so much more.